PHOTO BY JONATHON BIRD Seneca East's Blane Cottingham catches a touchdown pass as Newark Catholic’s Mason Lohr defends. Cottingham’s teammate, Collan Martin (6), looks on Friday. 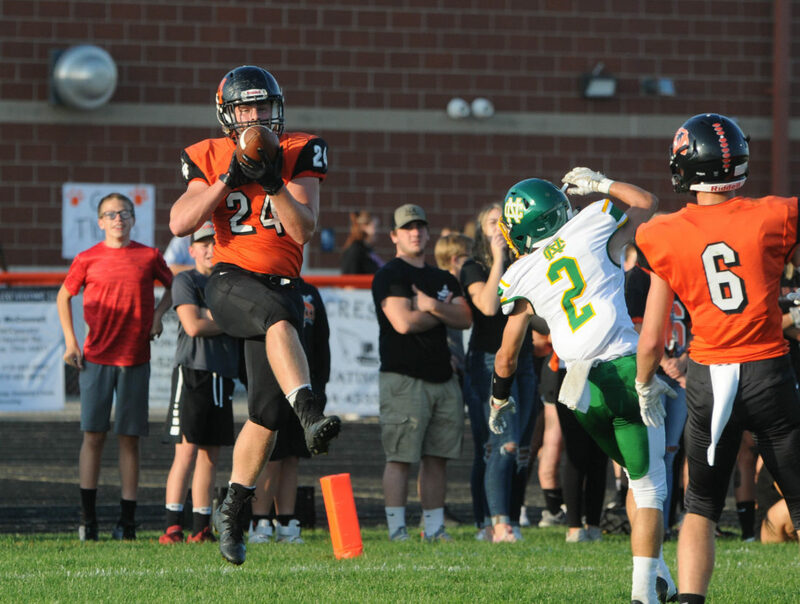 ATTICA — Seneca East saw a handful of injuries, but the Tigers remained strong as they held Newark Catholic to around 130 total yards. The Tigers had many players step up and help take control of the Green Wave in a 20-2 win in the home opener. “We had a lot of other guys go down and we had guys go out there and grow up under the Friday night lights and not skip a beat,” Seneca East coach Ed Phillips said. Chase Foos went down just before halftime which forced Blaine Swartzmiller to take the helm and lead the team. Foos tossed for 113 yards with a 28-yard touchdown pass to Blane Cottingham that gave the Tigers a 6-0 lead. Cottingham led the Tiger receivers with 45 yards. Phillips said the gameplan was to come into the game passing. He added his offensive line adjusted and took over the football. “Those guys deserve a lot of credit because they were good when Chase was in there and they were great when the chips were on the table. Our O-line and defense just owned the game,” he said. Swartzmiller led all rushers with 223 yards and two scoring runs. He also threw for 27 yards. The senior’s first score came on a 14-yard sprint with 18 seconds left in the first half for a 13-2 lead. His other was a 2-yard plunge with 48 seconds remaining in the third quarter that led to the winning score. The Green Wave only managed 137 total yards offensively. “Our kids are tough, physical kids and they love to hit. They love to pressure,” Phillips said. From last week’s film, Phillips said that Newark’s quarterback had four seconds to get a pass off but he told his guys, “He’s not going to have four seconds against us. “I think we got a couple hits on him early and he got a little head-shakey. It wasn’t just up front, it was the DBs too,” Phillips said. Newark coach Ryan Aiello knew he would face a tough, physical against the Tigers. With a total of 51 yards in the first half, Newark struggled to get things going. The second half was a little more successful when it ran the ball. Matt Carlisle led the Wave with 39 passing yards while Mikey Canning rushed for a team-high 62 yards. Lucas Pierce finished with 28 receiving yards.